Rich, creamy and not too rich – well, at least by my standards!! – this cheesecake is a real show stopper. It can be made in a pie pan or a springform pan whichever you prefer. 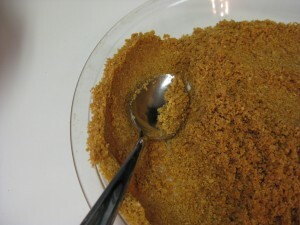 When putting a graham cracker crust into a pan, I dump the crumb mixture into the pan and then form the sides with a spoon. Then press the remaining crumbs into the bottom. Be sure not to make it thicker where the crust comes up the sides. I usually like to bake my crust for 6 – 8 minutes for crispier results. 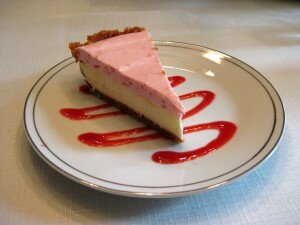 For a really creamy, smooth cheesecake, all ingredients should be at room temperature. If the cream cheese has been refrigerated you can use the microwave – carefully – to soften it. 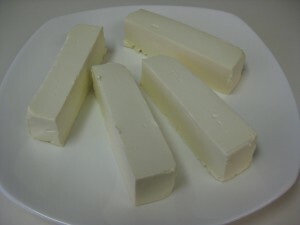 Cut the blocks in half lengthwise for even warming – microwaves penetrate about 1 inch – and microwave in 10 second intervals until the cream cheese is no longer cool to the touch. Cream cheese cut for even softening in the microwave. I use homemade raspberry freezer jam in this recipe. The taste is so much more like fresh raspberries. If desired, you can double the Raspberry Mousse part of this recipe when making it in a springform pan. So good!!! Mix graham wafer crumbs and sugar in bowl. Stir in melted butter until crumbs are well moistened. Press crumbs up sides and on bottom of 9 or 10 inch pie plate (or use a 9 inch springform – press crumbs about 1 inch up sides). Bake shell about 6 – 8 minutes. Cool about 10 minutes or more. Beat cream cheese with electric mixer until smooth. Add sugar and beat till smooth. Add eggs and beat just until well mixed (do not overbeat). Beat in sour cream and lemon juice. Spread mixture evenly into crust. Reduce oven to 300 F. Bake 30 – 35 minutes, until centre is just set – it should not brown. Cool completely at room temperature on a wire rack. Do not chill until Raspberry Mousse has been put on. Do not make Raspberry Mousse until cheesecake has cooled. 1/2 cup raspberry jam – homemade freezer jam is best!! Sprinkle gelatin over water in small microwaveproof bowl – do NOT stir. Let stand 5 minutes. Microwave on High 20 seconds; stir until gelatin is dissolved (you cannot see any granules). Gradually whisk in preserves; add lemon juice. Let cool completely in fridge until just beginning to set – about 10 minutes. Beat cream and sugar in bowl to stiff peaks; fold 1 or 2 spoonfuls of whipping cream into raspberry mixture to lighten the raspberry mixture then fold in remaining cream. Spread Raspberry Mousse on top of cheesecake. Cover and refrigerate several hours or overnight until set.